Teacher Sandy Fajgier watches as her pre-K students use VHS tapes — circa 1980 — as blocks at the K-280 pre- K center in Brooklyn. Students get creative in the block area, which features a projector for casting light and shadow. A student arranges jewelry on the projector to create an interesting image. In the block corner, a trio of 4-year-olds is winding a string of LED lights through a complex wooden structure topped with flowers, magnetic tiles and toy dinosaurs. Tucked behind a curtain in a darkened area of the room, another trio is playing house, addressing each other as “Mommy” and “Daddy.” In the art studio, one girl is wrapping a pipe cleaner around a stick she collected in the yard the day before, while another carefully affixes colored tape to a drawing. It’s a typical morning in Sandy Fajgier’s prekindergarten classroom at K-280 in Windsor Terrace. 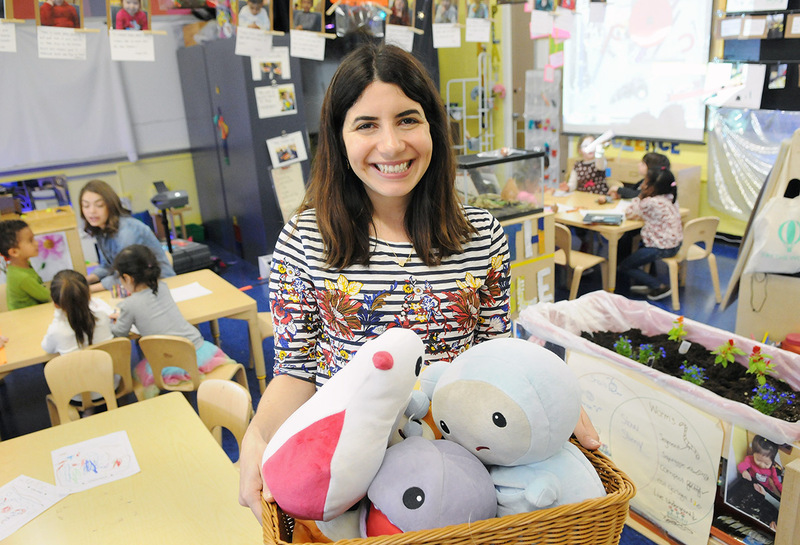 At K-280 — a pre-K center affiliated with PS 10 that is also known as the School of Inquiry and Journeys — teachers like Fajgier eschew traditional curriculum in favor of the Reggio Emilia approach to education. The Reggio philosophy encourages teachers to let children investigate their own interests through exploration and play. “This is what kids should be doing, exploring the world through their lens,” says Fajgier. Most educators are familiar with the term “backward planning,” in which teachers begin with a specific learning objective and plan lessons designed to help students achieve that objective. It’s a strategy that Fajgier has cheerfully discarded. Because the Reggio philosophy emphasizes the idea that the environment is a second teacher, Fajgier is deliberate about how she arranges her classroom and the materials she sets out for children to use. Jonathan FickiesFajgier shows off a basket of kimochi characters she uses to teach children about expressing emotions. Each day begins with a “provocation,” or an arrangement of materials that invites children to play. Students may encounter a vase filled with flowers, for example, or a stack of VHS tapes Fajgier happened to find one morning on the way to school. During their meeting, students agreed that the tapes resembled building blocks and belonged in the block corner, where they joined a variety of other found building materials. As students play, Fajgier listens to their conversations, asks questions and documents their behavior, which helps her reflect on the arc of students’ inquiry over time. She’s careful to ask open-ended questions and to guide children without directing them or “spoon-feeding them information,” she says. In the block corner, for example, Fajgier recently placed a series of mirrors and closely observed students’ interactions with them. During their “choice time,” Fajgier’s students read books, use art materials and build with blocks. But they also experiment with flashlights, light boxes, LED lights and projectors. Fajgier acknowledges that even her daily morning meeting — a hallmark of most early childhood education classrooms — is slightly unorthodox. Amir Keinan, a special education teacher who works with a student in Fajgier’s class, says this approach has paid off. On a recent morning, the “morning meeting leader” shared the news that her mother had brought home cookies the night before. Then she took questions from her rapt audience: What kind of cookies were they? Why did your mommy bring them home?